The monograph comprises two articles, viz, Anekānta : The Philosophy of Non-absolutism and The Axioms of Non-absolutism, both written by Acārya Mahāprajña. The articles are written with axiomatical focus and indeed, with an original thinking in which a thorough investigation on Anekant is vividly reflected. The origin of the concept of Anekānta is not easy to trace in the Jain Canonical texts. But the ontology of the early Jainism is apparently found to be influenced by this doctrine. Anekānta, the word, was first explored in the philosophical era as early as 5th Century A.D. 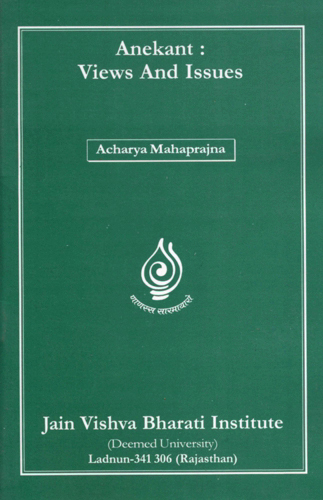 In these two articles, Acārya Mahāprajña has dealt with the philosophical concept of Anekānt. He lays emphasis on the right view to establish the theory of Non-absolutism and opines that the perverted view leads to the absolutistic standpoint. In his first article, i.e. Anekānta:The Philosophy of Non-absolutism, he deals with Relativity, Reconciliation, Co-existence, Anekānta and Democracy and the quest for the truth and consonance. The second article: The Axioms of Non-absolutism discusses the concomitance between the universal and the particular, between the permanent and the impermanent, between existence and non-existence, between speakable and the unspeakable, between substance and the mode and so on. He also deals with other facets of non-absolutism, such as Non- absolutism: Result and problems, the Doctrine of conditional dialectics (syādvāda) and sevenfold prediction (saptabhañgī) etc. Both the articles have depth and coverage so as to quench the thirst of the student of Jain Philosophy, specially the theory of Anekānta.